May and June always get so busy around here with everything that goes on at school that I always get behind on my blog posts. 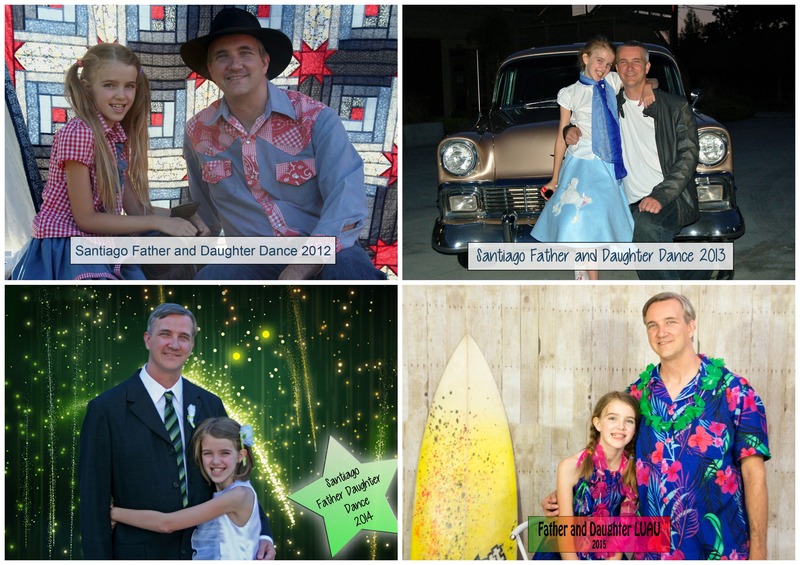 Let me start by telling you about the 4thAnnual Father and Daughter Dance! I remember when I wrote about the very first Father and Daughter Dance I took time out to tell you that Jenna and Mo were running for Co-Presidents of the PTA. They went on to win and do an amazing job for the next 2 years. Last year they each took PTA board positions but not as presidents. Let me announce that they are going to recreate their roles as Co-Presidents of the PTA for the 2015-2016 school year. Now back to the dance. This year’s theme was a Father and Daughter LUAU – no coconut tops permitted! They had to put that on the flyer because Santiago is a K-8 school and you can’t take the dress code for granted! The Dads were all thrilled as Hawaiian attire is simply shorts and a flowered shirt and sandals – the kind of attire they are most comfortable wearing! Just like every year, a lot of work went into this dance done by a great committee headed up by Mo with Jenna as her right hand. 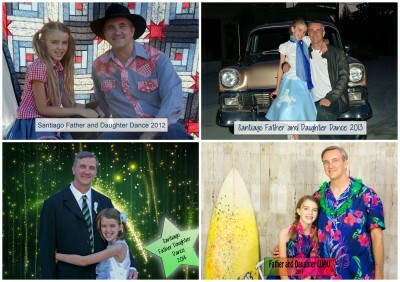 The Father and Daughter Dances exist because it had always been Mo’s dream for her daughters to attend a Father and Daughter Dance as she had done with her own dad! So she has made it happen. I love being part of this committee each year. I get to do fun things like go to Ola Hawaiian BBQ to sample the delicious food they were going to cater. 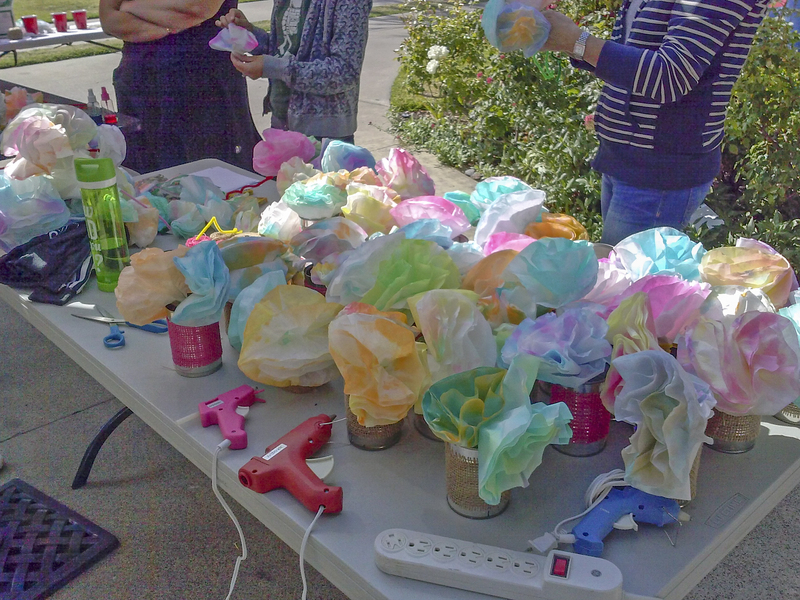 I also spent one Sunday afternoon with some of the moms and their kids making beautiful table decorations – flowers made from coffee filters and sprayed with different food colors. These were placed in tin cans wrapped in burlap and tied with a ribbon. They were beautiful and reminded me of hibiscuses. It amazes me that each dance is better than the one before and with even more students in attendance. I think the final count this year was 275 attendees. The weather was perfect again! When setup time finally got there, we covered the outdoor lunch tables with brown butcher paper tied down with tulle. Mo had made a special trip to the beach to get us some sand and we spread it down the middle of the tables. It looked like you were at a luau on the beach. We also added sand to the little tin can vases to hold them down before filling them with the paper flowers. We’ve had trouble with the decorations trying to blow away in past years. This year we were ready for Mr. Wind who always seems to come around dusk. We even found a great place to set up for photos that gave us some protection from him. Green crepe paper hung around the area to look like hula skirts. There were tiki torches around the grounds. 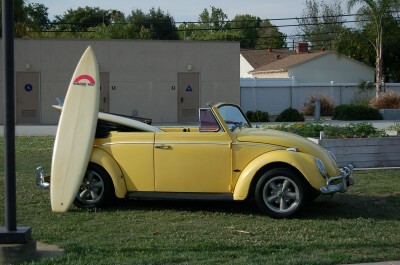 Mo even got us a yellow VW convertible with surfboard sticking out of the back seat for ambiance! In fact, we had surfboards strewn around the area. All these little details made it extra special. This year the check in table had Hula Dancers! One of the playground supervisors is part of a Hula Dancing Team and they offered to come to the dance and help. 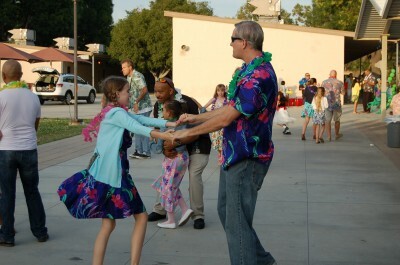 As each Father and Daughter entered the dance, they could get Hawaiian lei to wear! 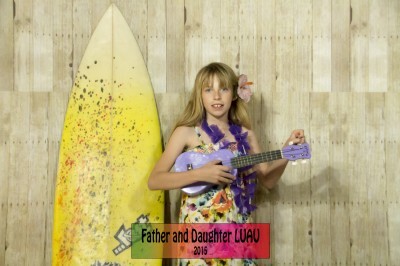 The Hula Girls placed the leis on the Dads and girls just as they would in Hawaii. Everyone loved it. Later during the evening, they did an amazing demonstration for everyone! All the little girls were trying to learn it! I should also add that the male dancer used to be a student at our school. Jenna found a cute idea for the photos on Pinterest! Someone had used a white washed looking fence with surfboards balanced against it as a backdrop! We liked the idea and managed to find some awesome corrugated paper with a white washed fence pattern on it. We borrowed a couple of surfboards from one of the Dads and we had our backdrop! Just like prior years I didn’t get to see much of the dance – I took my last picture at 8:22 but I did have one of the best views of the night. I got to see every couple – many of them I have photographed the previous 3 years and it is amazing to look back and see how much some of these students have grown. I also got to hear the “ews” and “ahs” from all the students in the photo line when the Kona Ice Truck pulled in – this was their dessert and they couldn’t wait to go get it! Just like I have taken the photos for the last 4 years, Amara’s Grandma Judi has handmade Amara and her Daddy’s outfits for each dance. They looked so cute in their matching outfits and the blue in that dress just made Amara’s eyes pop! In keeping with the luau theme, Mo asked all of the volunteers to wear flowered or Hawaiian styled attire. Jenna and Mo still haven’t learned their lesson about shoes — both of them had very sore feet by the end of the dance! But they looked good and they did an amazing job. Mo works hard to make sure the dance is kept within budget. To help with defraying the cost of the dance we always have a lot of raffles! This year’s prizes were amazing. One family had even donated Disney tickets! All of the raffle prizes were intended to give the winning daughter and dad a second date. I’d had fun the month before going with Jenna and Amara to get donations – which of course meant we had to stop and have yogurt! With all of these wonderful raffle prizes, Mo’s budget was safe. One of the students brought two of her ukuleles. She even let the students use them as props to pose with for the pictures if they wanted to. Her Grandfather, who is the one who escorted her to the dance for the 4th year, has taught her to play. Later that evening as I was tearing thing down she serenaded me with it! She was impressive and it was the perfect way to end my evening! 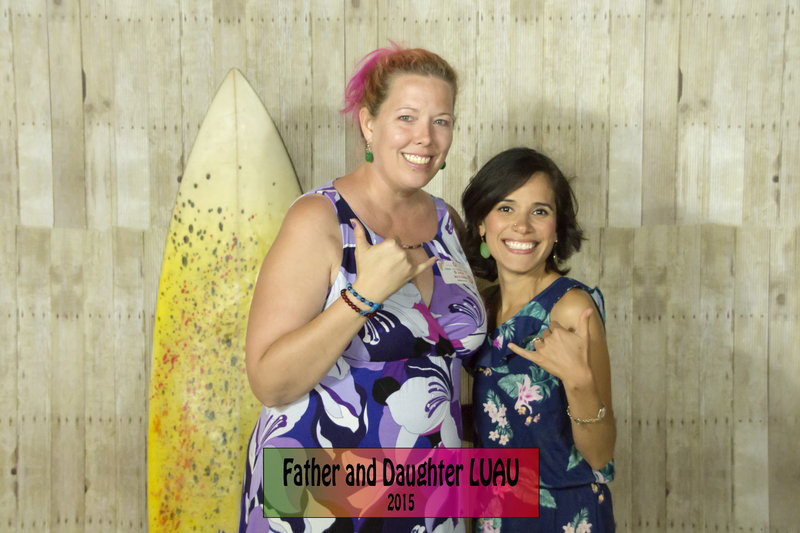 This memory was posted in Special Occasions, Volunteering and tagged Amara, dancing, Father Daughter Dance, LUAU, PTA, school, volunteer on June 23, 2015 by Grandma Kc. What fun! And I got a kick out of the “no coconut tops” rule! Some of those girls do not look their age! Amazes me how much some of Amara’s 5th grade friends have developed this year! Such a work of hands and hearts working together in such love and caring for the whole event from beginning to end. Made a memorable and special event in the hearts of all. What special people, all of you, and it is just so heartwarming and inspirational to see the whole situation unfold over time as every little detail given the attention as it were the only thing. Thank you so much for sharing. It has been a very extraordinary celebration of such genuine love and caring. It really is an extraordinary celebration! I am so glad that I get to be part of it. It is such a good feeling to watch the faces of all the girls and of the dads, too. We’re already busy researching ideas for next year. Maybe some moms and grandmas will read this and start something like it at their school! They would get lots more out of it than they put into it! Quite the impressive event. It looks like a stunning success. I wish every little girl could have a dance like this with their Dad! I wish I’d had one with mine! Thank you, Judy! I do love my role of volunteer! I’m so very glad I get to be part of all of it all. That I live close by, that Jenna and Mo want my help — I have a good life! What a great event! Everyone obviously worked really hard to make it that way. We’re lucky grandparents and Amara is a lucky girl to have such great parents! You are right on all counts! We are very lucky and so is Amara! I’m also very lucky to have your support in everything I do! Adorable! I love that you ended with the serenading student. My husband is loving the ukelele I got him for Father’s Day. Such a cool instrument. THIS is a fabulous event. Fun, fun, fun all the way through. I chuckeled at your “no coconut shell tops” comment. And it’s pretty darn great you got to help taste-test the food. THAT is a committee I’d be happy to be on. My best friend is a Hawaiian, with true Hawaiian and Chinese parents. She belongs to a hula group here in town, and at 60, she still loves to do the authentic dances around town for various things. Her adult daughter and teen granddaughter are in the troupe, too. Lovely dances and such an interesting culture. And a lovely time for Amara and the gang! Thank you for sharing!! I think the dancers really enjoyed themselves and loved being part of such a memorable event! 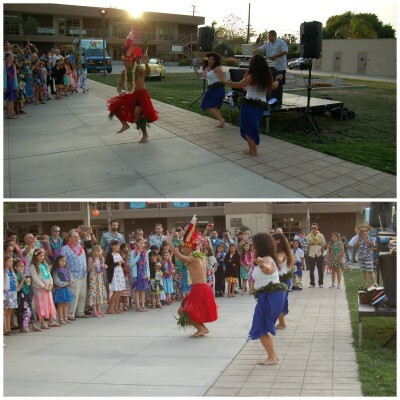 I bet there were a lot of little girls who went home and wanted Hula dance lessons this summer! I don’t know how we are going to out do it next year but I bet we do! I wish you could find someone to bring this to Valentina’s school. I just know that these students and parents are going to remember this forever! I sure know that I will. What a great evening! Love the photos! Cudos to Mo for following her heart and making this dance happen, not just one time – but now four years! So many happy memories for everyone – and who knows how many of these little girls will be inspired to help organize one for her future daughters! 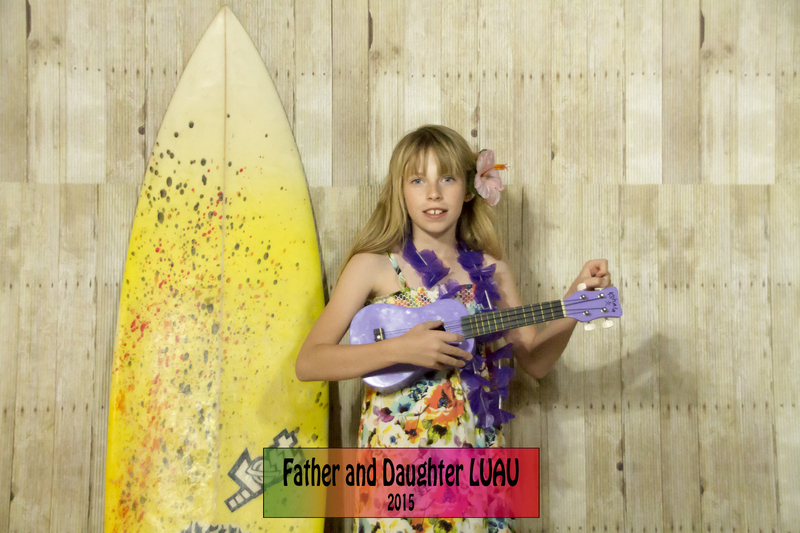 So many wonderful special touches – the yellow VW, the surfboards, the hula dancers, sand on the tables! It really sounds like they nailed it again this year!! Jenna and Mo are a great team! Santiago School is very lucky to have so many involved parents and grandparents in the PTA! Keep up the great work everyone! It really is all of the little details that make it so extra special and that is sure where a team comes in! Everybody comes up with such great ideas and they’re willing to put in the effort to make it all happen. Every year Mo and Jenna have worried that they wouldn’t sell enough tickets and we always sell out! They worry there won’t be enough raffle prizes – and there are always are! We have little hiccups sometimes — like the DJ and the stage getting lost but they got there on time! It always all works out! Well, I think the coconuts would be just the thing to wear under those daddies’ shirts… LOL! LOL! 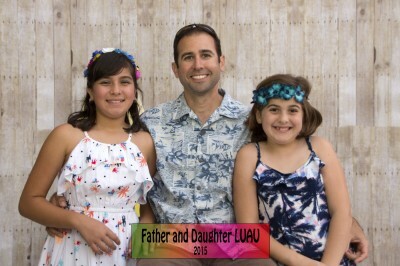 There was a father/daughter dance at Noli’s school — it was a dress up affair! She wore a long blue dress that she had worn as a Junior Bridesmaid for her uncle’s wedding (dad’s brother). I wonder how they were able to dance — her dad is 6’7″ !! Stephanie’s schools didn’t have them, or Dennis would have taken her for sure! 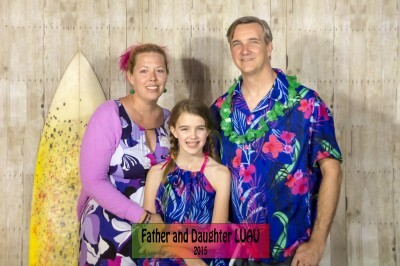 I know Amara and her dad had a great time at the luau! Now that would have been funny if one of the Dads had worn a coconut top with his shirt unbuttoned! Last year’s theme for the dance was a Night Under the Stars. The girls loved it because they got to get all dressed up but the Dads like the shorts idea much better! It really was the perfect way to end the school year! Hi Kc – I had a hard time finding this current blog! Glad I finally tracked you down. That’s a great turnout of fathers and daughters for the dance. I can imagine the hard work it involved. Looks like everyone had a great time. Glad you could stop by! The dance is a lot of work and worth every moment of it! Volunteering gives me a chance to be part of things I would never be part of otherwise. Kids help keep us young! I’ve loved sharing them with you, too! Where would we be without our cameras?! I have actually wondered where we would be without cameras. I just did a project with the girls and it all goes by in such a whirl that if it weren’t for the pictures? Well, let me say, I love being able to look back and see. Also, a friend and I were recently discussing those big group efforts and how it is so much work, but if we didn’t do it, when we would ever really spend that kind of time together, like you and Jenna, or Jenna and Mo. If there isn’t something like that, so much else calls us to independent endeavors, putting off that kind of close contact. Then your hard work results in such fun, culture sharing, marking endings, noting growth and a take-out of feeling good about yourself and your work. A marvelous thing. Jenna, Mo and all of the PTA and volunteer moms are so nice and I am so glad to have become part of them! It is the close contact that makes it so special. And as for your event with the girls — that Fairy Ball was awesome! I told Jenna and Amara all about it. Amara still has dress up clothes here that she likes to play with. She gets taller but stays so slender that they still fit! Wow! Another super-duper winner of an event! I can always see Jenna’s creative touch in her attention to detail. What a great experience for those little girls – to be the sole focus of their devoted daddies for one night! And everything is taken care of for them! Just jump into those shorts and tropical top and enjoy, daddy! I especially love the collage of Amara’s past dances. Fun themes every year! And you are so fortunate to be part of it all, Kc! I am so lucky to be involved but I have to say it frustrates me that there are so many other grandparents at the school that aren’t involved. They are missing out on so much fun and the behind the scenes stuff is always the best!